Forged, fully assembled lower is ready for your choice of upper. Precision machined from 7075-T6 aircraft-grade aluminum alloy, mil-spec hardcoat anodized, then Teflon-coated black for superior wear and scratch resistance. Includes mil-spec trigger group. 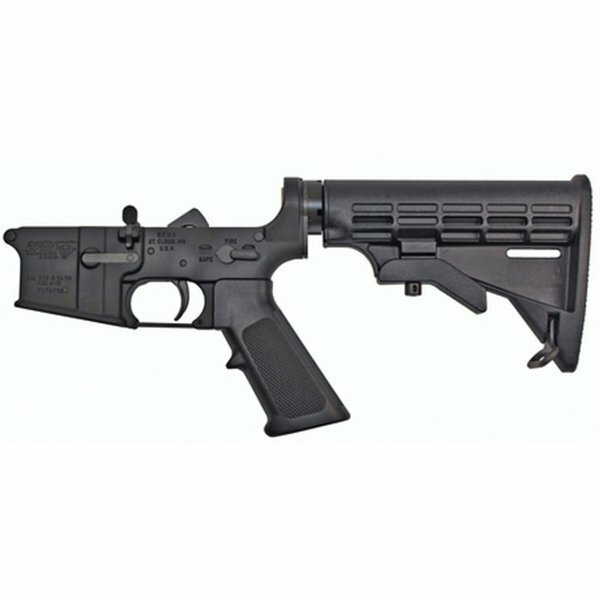 The M4 lower is equipped with a 6-position, collapsible carbine stock made of impact-resistant polymer. Inferiore forgiata, completamente assemblato è pronto per la vostra scelta della tomaia. Lavorati di precisione da 7075-T6 in lega di alluminio del velivolo-grado, mil-spec hardcoat anodizzato, poi nero rivestito in Teflon per superior usura e resistenza ai graffi. Include il gruppo grilletto mil-spec. La M4 inferiore è dotato di uno stock di carabina 6 posizioni, pieghevole realizzato in polimero resistente agli urti. Perfect lower. Matched both colt upper and two other uppers. Excellent trigger. Not DPMS second but high DPMS first line quality. Using this lower for a 300blk, great for the money and no real issues. Other than the standard imperfections that come with all DPMS lowers and that the roll marks on the lower I got where off center. I wanted this for home defense and hunting for my daughter. Its great for the money and it fit the radical firearms upper socom sold by brownells perfectly. My only dislike is the buttstock and trigger guard both rattle a lot when shouldering the gun. Not Ideal in a hunting situation. Otherwise I would give it a 5 star rating. This is a very good lower. The trigger, the fit and finish are excellent. The trigger is more than I had expected. The stock and the trigger guard rattle. Magpul replacements solved the problem. I am in the process of ordering my second DPMS complete lower for my next build. I bought this for a Delton M4 factory upper. It was a perfect drop in fit. After 200 rounds no problems to report. Shoots just fine. At $159 and free shipping a great deal! I used this complete lower to do a .300 blackout build. I was well pleased with this lower and the fit and finish. Bought one to pair it up with Brownells' AR-15 5.56 complete flat top upper. The fit was perfect! Took it to the range and zeroed it. No stoppages, just smooth cycle of operation. Great gear for the price! First time I've purchased a DPMS lower and was pleased with everything but the sloppy fitting collapsible stock. Fit and finish were excellent for everything else and I was shocked by how good the trigger feels. I'm not going to bother replacing it, it's that good. If it wasn't for the stock, I'd have given it a 5 star and I wish I could have given a 4.8 but it's either 4 or 5. For the price though, it can't be beat. I bought this and it fits well with a M4 chrome lined upper from Delton. Functions just fine as too. Please note that it does not say 5.56mm on the well but Multi-Cal! Parti Fabbricante: 60593 884451000594 Forgiato, completamente assemblato inferiore è pronto per la vostra scelta della tomaia. Lavorati di precisione da 7075-T6 in lega di alluminio del velivolo-grado, mil-spec hardcoat anodizzato, poi nero rivestito in Teflon per superior usura e resistenza ai graffi. Include il gruppo grilletto mil-spec. La M4 inferiore è dotato di uno stock di carabina 6 posizioni, pieghevole realizzato in polimero antiurto. Forgiato, completamente assemblato inferiore è pronto per la vostra scelta della tomaia. Lavorati di precisione da 7075-T6 in lega di alluminio del velivolo-grado, mil-spec hardcoat anodizzato, poi nero rivestito in Teflon per superior usura e resistenza ai graffi. Include il gruppo grilletto mil-spec. La M4 inferiore è dotato di uno stock di carabina 6 posizioni, pieghevole realizzato in polimero antiurto.